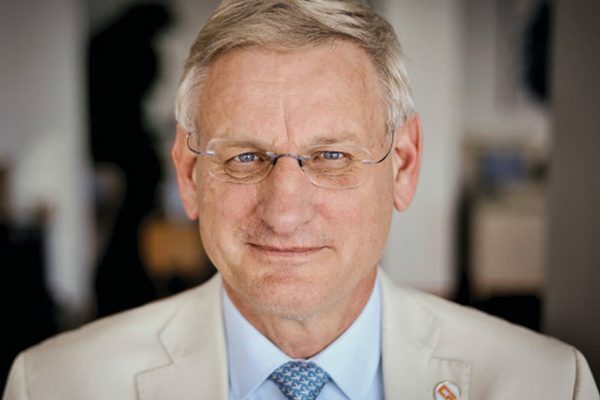 Carl Bildt – Microsite – Carl Bildt is an international diplomat who delivers keynote speeches on international security policy, the governance of the internet, European and world affairs and geopolitical challenges, including the Middle East. Carl Bildt was Sweden’s foreign minister from 2006 to October 2014, and was Prime Minister from 1991 to 1994, when he negotiated Sweden’s EU accession. He also undertook far-reaching liberalisation and structural reforms, improving Sweden’s competitiveness and modernising its infrastructure. A renowned international diplomat, Carl is a visionary of Europe and an expert on world affairs. 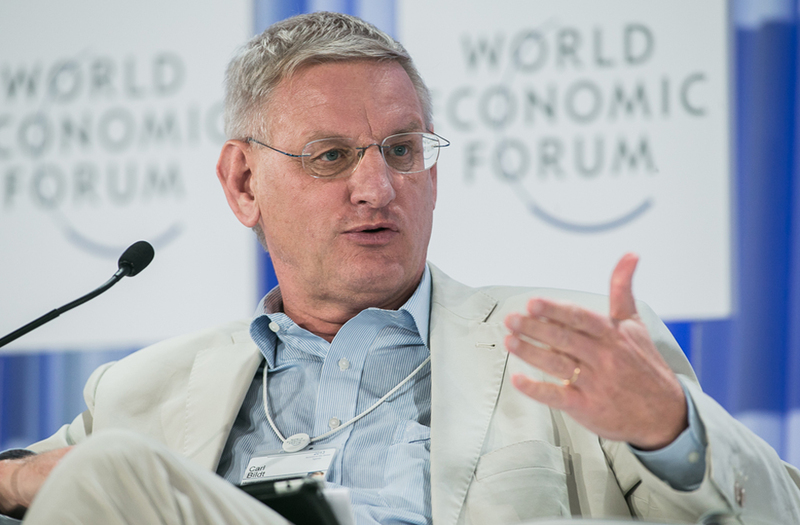 He is the Chair of the Global Commission on Internet Governance and has served as EU Special Envoy to the Former Yugoslavia, High Representative for Bosnia and Herzegovina, UN Special Envoy to the Balkans, and Co-Chairman of the Dayton Peace Conference. He is a member of the World Economic Forum’s Global Agenda Council on Europe and co-chair of the European Council on Foreign Relations. You received international acclaim as the key mediator in the Balkans conflict and are seen as a visionary of Europe and an expert on world affairs. Do you find working in the international side of politics more challenging and rewarding than focusing purely on domestic affairs? These days they are closely connected, and in particular in a country as dependent in the outside world as Sweden. Geopolitical tensions, economic trends or technological change impact on us all much faster and more profoundly than in the past. And there is little doubt that after a couple of decades where the positive was far more important than the negative, we have now entered a more challenging and perhaps even dangerous period. Globalisation is still a powerful force. But geopolitics is coming back with a vengeance. And we see sectarianism and identity issues tearing societies apart. What do you believe are the current and future challenges in the governance of the internet and can they be successfully overcome? The politics of the net is becoming increasingly important. The net has rapidly become the most important global infrastructure and, with what we now see, it will soon also be the infrastructure of all other global infrastructures. But there is a trust deficit building up that could become dangerous in that it might fuel policies that risk disrupting the net. We see it in suspicions of mass surveillance, or fears over how large corporations will use big data. But we also see how geopolitical tension and the fear of regimes for their stability are driving efforts to undermine the open and global nature of the net. With greater levels of unrest in Europe and further afield how important do you feel strong, political leadership is in the world today? It’s both more important and more difficult. We face an array of challenges that test the ability of even the most astute leader. But this makes it even more important to try to understand the important trends, and to formulate the policies that will be needed. Since leaving office you have joined more advisory boards and organisations with a wide range of remits. Do you see this type of involvement increasing over the coming years and do you find it as fulfilling as holding political office? In many ways it is dealing with the same issues and challenges, although of course in different ways. But I do believe that it is increasingly important to be part of the global dialogue on the challenges we face, and naturally it is an advantage to do that with the background of having had different political offices for a longer period of time. Russia is once again at the center of policy debates in many Western capitals. And for the third time in a row, a new US president will start his administration with ambitions to improve bilateral relations. To understand why achieving this goal has been so difficult… Read more. Angry American voters who feel slighted by the Washington establishment have had their say. A stunned world must now come to terms with what the election of Donald Trump as the 45th President of the United States means for global stability in the years ahead… Read more. We are living in dangerous and uncertain times. The United States is engaged in a bizarre and highly polarized presidential election. Its relationship with an increasingly revisionist Russia is undergoing what is essentially a “re-set” in reverse, while Russia’s revisionism is… Read more. 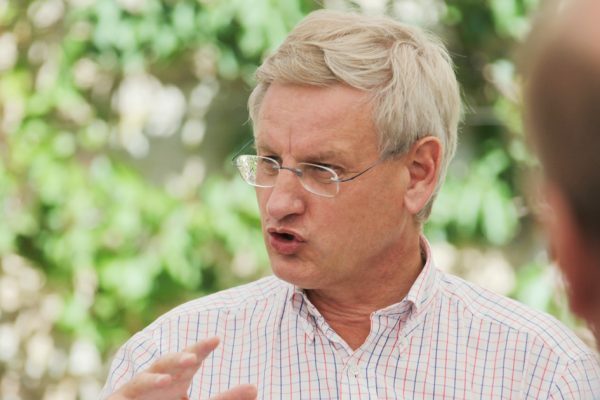 Noted internationally for his activities in resolving the Balkan conflict, as a visionary of Europe and an expert on world affairs, Carl Bildt came of age as a thinker at a time when politicians and intellectuals sought refuge from war in the power of international organizations. He offers privileged insights to those who want to place their organisation advantageously for the future. Qualified, robust, and charismatic, he examines leadership in adverse situations and shows how to successfully negotiate at the highest level. 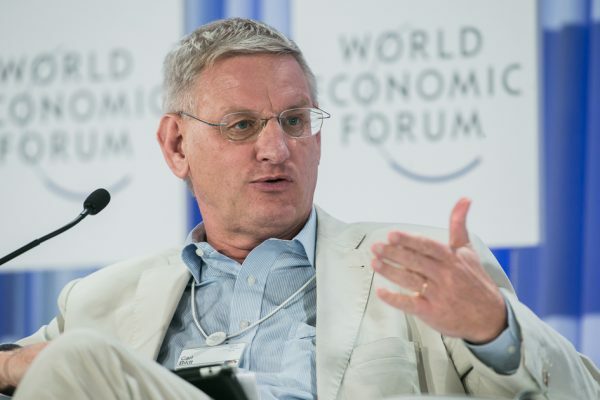 An excellent and engaging speaker, highly respected amongst his peers, Carl Bildt is in demand as a keynote speaker around the globe. He’s telegenic, charming, experienced, and ambitious. Savvy when it comes to the media, he has a cunning, deft touch for geopolitics. If you would like to book Carl Bildt for your next event, please call Dagmar O’Toole on +44 1628 601 462 or send an email to dagmar@speakers.co.uk.